The Dayton Hamvention is coming up very soon and several of our listeners have asked if we're ever going to have custom hats and T-shirts and such made up since we now have a spiffy new logo. The answer to that question is simple: Yes! Thanks to Printfection, we now have an online shop where you can purchase accessories, drinkware and apparel items of your very own. We would really appreciate it if everyone who was a fan of the show would stop by and grab a shirt or a coffee mug from the shop. 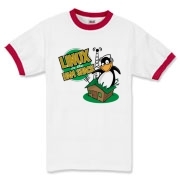 When you purchase items from the Linux in the Ham Shack store, you will be donating between $0.99 and $1.99 per item, depending on which ones you select, to our hosting fees. You get a fun new item to show off to all your family and friends, and we get a little bit of promotion in the process. It's win-win! Printfection currently does not offer headwear, but we're looking into alternatives for that. If you happen to be coming to Dayton or to the Southeast Linux Fest, make sure to get your LHS promo items before you show up. We'll be looking out for you, and there may even be a prize in it if we see you wearing one of our shirts or drinking out of one of our mugs or can coolers. You can find the store at http://www.printfection.com/lhs. Why not check it out today?